Take Cover! Zimbabwe Hits Vol. 1 (DiscAfrique AFRI LP 01, 1986), and its sequels, Goobye Sandra: Zimbabwe Hits Vol. 2 (DiscAfrique AFRI LP 05, 1988) and Advance Kusugar! Zimbabwe Hits Vol. 3 (AFRI LP 006, 1988) capture a magic moment in African music - the optimistic years immediately after Zimbabwean independence in 1980. Thomas Mapfumo and the Bhundu Boys are familiar artists from this period, but these collections highlight musicians who aren't as well-known outside of Zimbabwe. I'm pleased to offer Take Cover! today, with the other two volumes to follow soon. James Chimombe & the O.K. Success - B.P. 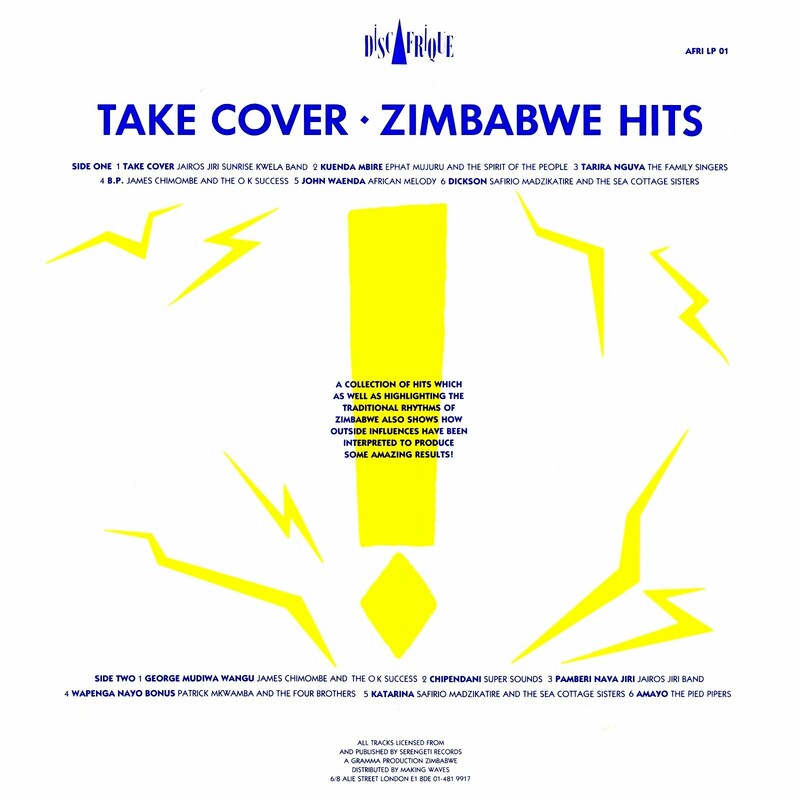 Download Take Cover! Zimbabwe Hits Vol. 1 as a zipped file here. Researching this post I found the book Roots Rocking in Zimbabwe by Fred Zindi (Mambo Press, Harare, 1985) very helpful. The translations of the lyrics are taken from the US edition of Take Cover! (Schanachie 43045, 1987). Many thanks for these Golden Oldies by some of Zimbabwe's greatest artists. The memories are just good! loved all the uploads on zimbabwe.May you please upload for me Edwin Hama's album called -Asina Mali.